Home	Board index Model Railway Electronics and Technology New discoveries??? Have you stumbled upon something really cool and new in model railway. Share it with us. The dinosaurs will get little red Santa hats and have fragments of Christmas trees and a few baubles hanging from jaws and claws. No, not bits of Santa and elves. Unless my mood darkens. 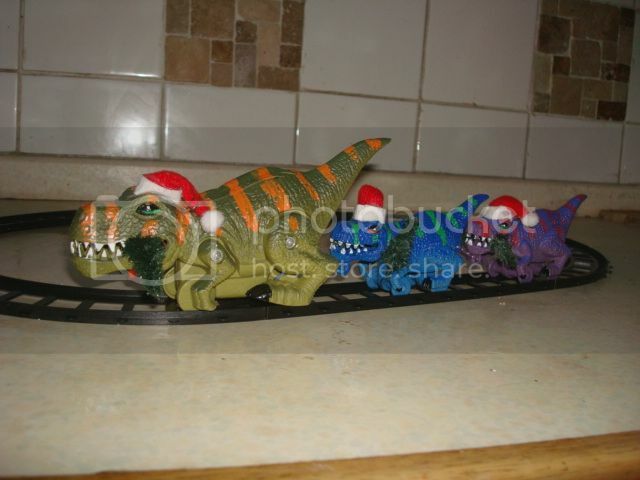 "T-rex Battery Operated Train Set " £7.86 inc postage, when I found it. in which case, a reversal of train order would depict the ultimate tail chaser and the food chain of survival??? If you want to engineer it: the motor's in the big one. Saw a lovely battery powered train set today. It had a steam loco, two lovely bogie coaches and two bogie wagons. Actually it may have had more then two. £15. It was larger then 00 but smaller then 0. Something like S gauge I guess? Not sure as not see S gauge for real. It looked so impressive. Kiddies and their daddies are going to love it! Last year among the amusing presents came a £9.99 train set in a tin. Today the the local Wyevale garden centre they were flogging the same thing in a cardboard box for £3.00. If there's any left in the new year they might pay you to take 'em away. I've seen those trainsets in a tin. They were £5 here and the same in a cardboard packet in another store they were £1.99 when I bought one last year. I gave it away. I guess where you live is a more expensive part of the country? Yup, you name it the Shakespeare Connection puts it premium on it. I didn't know Shakespeare was still alive.